Henry Cavill News: Bring It, 2015: Solo's Year To Shine Is Here! UPDATE (1/7): More previews added. 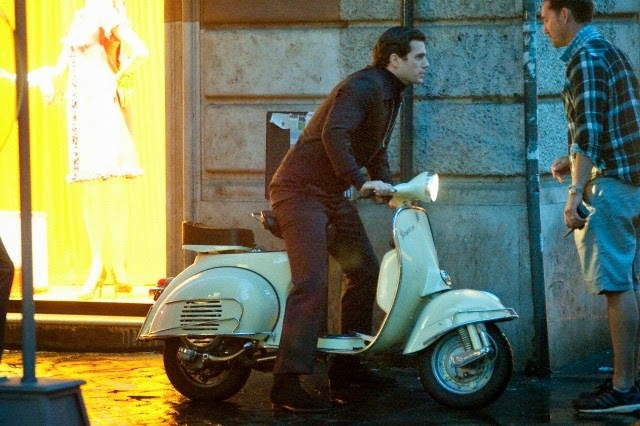 Henry rehearses Vespa scene while on location in Rome (10/13). It's a good thing 2015 has finally arrived, because we don't think we can take the wait for The Man From U.N.C.L.E. much longer. The movie wrapped at the end of 2013, and in no time we'll be bringing you promo news as its August release gets closer. Already the buzz has begun, with the film landing on many 'Most Anticipated' lists of the year. Here are some of our favorites, starting with Movie Viral which is not the biggest site. But we're loving Michael Lee, who proves you CAN be an unbiased writer (like ourselves in our other jobs), and at the same time a huge fan of Henry's. I love Henry Cavill. There, I said it. I think he has been sheltered in the shadows for far too long, and I am extremely happy to see him blow up after Man of Steel. It seems 2015 might be the year of the spies, as this marks yet another spy filled adventure. Guy Ritchie directs, and if his Sherlock Holmes films proved anything, it’s that the man sure knows how to entertain an audience. The Man From U.N.C.L.E. opens August 14. What You Need To Know: After Quentin Tarantino and Steven Soderbergh tried but couldn’t quite get there, it’s Ritchie who got a big-screen reboot of this classic before cameras, seemingly dumping the Scott Z. Burns script that Soderbergh was going to use but keeping its vintage Cold War setting. Cavill and Hammer step in for Robert Vaughn and David McCallum, while Grant (!) plays their boss, and Vikander and Debicki are the potential femme fatales. The Cavill/Hammer partnership might be the biggest question mark here, and it’ll need Ritchie to bring the fun and style of his first "Sherlock Holmes" film, rather than the tedium of the second, but we like the idea of a big-budget take on the sixties spy flick enough that we’re confident that this’ll be able to stand out, even in a year packed with espionage pictures. We’ll be seeing Henry Cavill without his Superman leotard in August as he takes on the role of CIA Napoleon Solo in Guy Ritchie’s take on the famous 1960s spy thriller. His sidekick comes in the handsome form of Armie Hammer, and in case that’s not eye candy enough for you, Ritchie’s pal David Beckham is rumoured to be making his silver screen acting debut. Cause for excitement: Hollywood's been trying to crack a new 'Man From U.N.C.L.E' for at least 15 years now, and it looks like Guy Ritchie finally figured it out. Or at least, we hope he did, because both Armie Hammer and Henry Cavill seem ready to show off what they can do. If they've got chemistry, it could be a huge franchise for Ritchie and Warner Bros, and a genuine counter-point to the spy games of 'Bourne' and 'Bond' alike. Possible warning signs: Hammer hasn't really had his moment yet, and while we feel like he tried hard to make 'The Lone Ranger' work, he really didn't work in the role. He and Cavill are obviously beefcake, but we're hoping they've also got the chops to make us interested in these characters from a barely-remembered-by-the-mainstream TV show. In something of a reversal of the original TV show, the movie adaptation of The Man From U.N.C.L.E. will see a Brit (Henry Cavill) playing American spy Napoleon Solo, with his Russian opposite number Illya Kuryakin played by Armie Hammer. Somewhat unusually, Guy Ritchie‘s film will be a period piece, retaining its early 1960s Cold War setting rather than updating to the present day. Hugh Grant and Jared Harris are among the supporting cast. 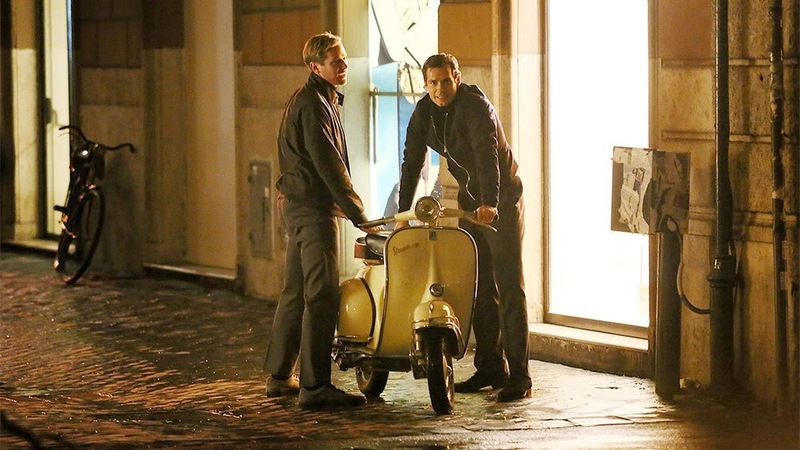 One of our exclusives from the Rome set of The Man From U.N.C.L.E. If you’re a fan of the James Bond movies, you’ll likely also be excited about Guy Ritchie’s upcoming movie The Man From U.N.C.L.E., a big-screen adaptation of a cult 1960s British secret agent TV series. It stars Man of Steel’s Henry Cavill pitted against The Social Network’s Armie Hammer in what should be a fun Cold War romp. Ritchie can be hit-and-miss as a director, but his Sherlock Holmes movies were more fun than they had any right to be. Hopefully that same mix of humor and action can carry over here. Guy Ritchie directs hotties Henry Cavell (The Man of Steel) and Armie Hammer (The Social Network) as the famous 60s duo that, in their sassy 60s pants, couldn’t be hipper if they tried. It’s hard to say if this will tank or succeed, as all involved have done both in the past. Based on the 1960s television series, Guy Ritchie's spy adaptation stars Henry Cavill and Armie Hammer as special agents working to track down evildoers. It also stars Jared Harris and Alicia Vikander. Warner Brothers just released new stills, and the official synopsis for U.N.C.L.E. - Now all we need is a trailer. Anytime now. Can we break this cycle of waiting for EVERYTHING?... PLEASE. Batman V. Superman comes out next year! Wow that feels good to say. Wow I need a life. It depends on the movie. Films like Batman v Superman have a longer turnaround time because they're usually VFX heavy and that takes longer to finish. In the case of U.N.C.L.E. - the move/delay is good news, since it likely means the studio believes it will perform well in the busy summer box office. So it's all good. U.N.C.L.E. promo should begin soon, followed by the BvS one, and that will be a monster ad campaign. Look at it as the quiet before the promo storm.